The Carthay Circle Restaurant is the most upscale in-park dining experience. Located in Disney California Adventure park, the Carthay Circle Restaurant is designed to look like the Carthay Circle Theater where Disney’s Snow White and the Seven Dwarfs premiered. Inside of the restaurant you will find an upscale bar and lounge on the first floor and a wide collection of different dining spaces located on the second floor. This Carthay Circle Restaurant review covers our experience enjoying the World of Color dinner package, viewing Disneyland fireworks from Carthay Circle, and our walking tour of the restaurant. The Carthay Circle Restaurant menu is a blend of the trending flavors of California plus a mix of the food from old Hollywood. All of the items feature fresh locally grown ingredients. Executive Chef Andrew Sutton has worked at the Disneyland Resort for a number of years and currently runs both the Carthay Circle and Napa Rose restaurants. With the help of his teams of chef’s and the upper Disneyland Resort food management the menu is constantly changing with the seasons. When we visited the Carthay Circle Restaurant we decided to try the World of Color three course meal. The meal features an appetizer, main course, and decadent dessert. 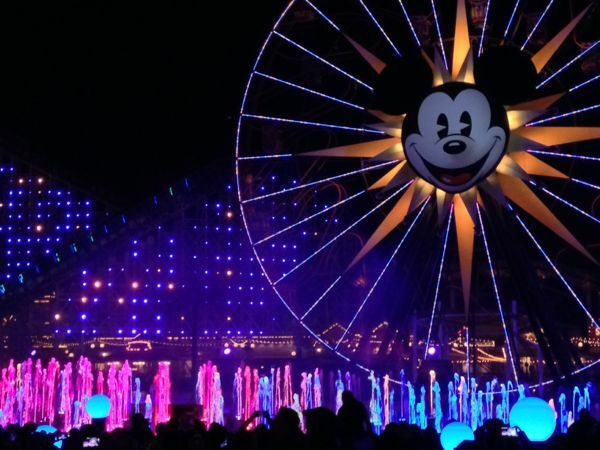 If you decide to enjoy this three course meal you are presented with three passes to the World of Color showing in a perfect viewing area that is front and center. My favorite part about choosing this option was that immediately after finishing our meal around 9:50 we walked over to World of Color and the show started just minutes after we had arrived. No waiting, no fighting for a FastPass, and lots of space to spread out and enjoy the show. The Carthay Circle Restaurant World of Color Menu included all of the following items. I gave added asterisks to the menu items that we tried and added extra descriptions. *Pumpkin Tortilla Broth – with Cilantro Grilled Chicken, Crisp Tortillas, Cream Fraiche. This is a very nice choice especially on a colder night at the Disneyland Resort. We were sitting on the terrace and so after the temperature dropped this was a perfect way to start the meal. *Carthay Autumn Salad – Butternut Squash, Baby Spinach, Red Endive, Dried Cranberries and Candied Pecans. This was a classic salad well put together and seasoned. *Sauteed Squash Raviolis – Forest Mushrooms, Savoy Cabbage and Imported Truffle Butter. The youngest member of our party really enjoyed this pasta–after trying it myself, the sauce is to die for. Strozzapreti Pasta – with Pancetta, Dried Tomatoes, Rapini, Roasted Garlic and Aged Provolone. Citrus Grilled Shrimp – on Chowder of Autumn Vegetables and Applewood Bacon. Sesame Soy Glazed Skuna Bay Salmon – Forbidden Black Rice Stir-fry and Red Thai Curry. Whole Roasted Petit Chicken – Squash Puree, Sauteed Chanterelles and Sage Essence. Angus New York – with Baby Portobello Mushrooms, Maple Roasted Yams and Cabernet Jus. Colorado Lamb Chop and Braised Lamb Osso Bucco – Zinfandel-Pomegranate Sauce. *Thick Cut Pork Chop – Thyme Roasted Pears, Brussels Sprouts and Brandy Thyme Jus. My dad and I both ordered the the Pork Chop and it was the best pork chop I have ever had. To begin with it was quite large and cooked to perfection. The pairing with roasted pears was classic but somehow special. We tried both of the desserts and thoroughly enjoyed them. *Warm Apple Pecan Pound Cake – with Salted Carmel and Green Apple Sorbet. The description does not do justice to this great combination of flavors. Definitely try it. *Cordillera Chocolate Decadent Layer Cake – with Raspberry Sauce. Based off of the opinions of various friends who have also eaten at Carthay Circle I feel that I can share some insight to the other best menu items at the restaurant. The below recommendations apply to the regular menu while the above section reviews the Carthay Circle Restaurant World of Color fixed menu. The overall popular choice is the Carthay Signature Fried Biscuits, stuffed with white cheddar cheese, bacon, and jalepenos. This a starter off of the basic menu. The Colorado Lamb Chop served with pomegranate sauce is known to be perfectly cooked with each bite melting in your mouth. Another highly recommended dessert is the lemon poundcake with marinated blueberries and fresh curd cream. 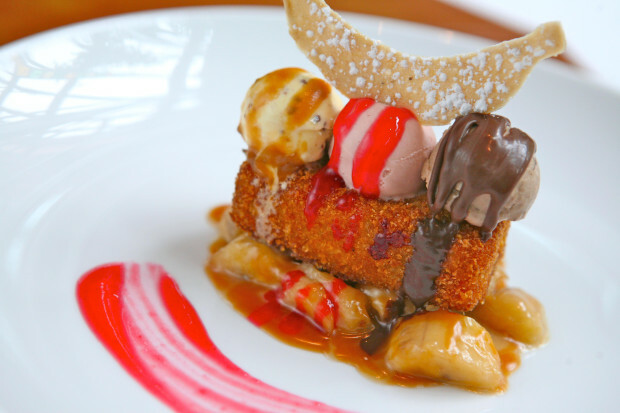 This dish is on the lighter side compared to the Monte Cristo Sundae. All of the Carthay Circle Restaurant dessert items are a rather small serving–but they are rich. I recommend getting different desserts and splitting them amongst your group. A unique feature at the Carthay Circle is that there are more than 92 sommeliers on staff. Experts in pairing food and wine, these sommeliers are have all passed the introductory level sommelier exam–the first of four tests to become a Master Sommelier. Our waiter was just one step away from becoming a Advanced Sommelier–that’s one step below the Master level. Over the year and a half that she had been working at the restaurant she had continued her study in the art of wine under the direction of the restaurant manager Joy Cushing. There is a great view across the entrance of Disney California Adventure and down Main Street to Sleeping Beauty castle inside of Disneyland Park from the terrace on the Buena Vista Street side of the restaurant. The balcony provides fantastic viewing of the nightly Disneyland fireworks show–or so I have heard. We reserved a table at Carthay Circle Restaurant for 7:55 pm so that we could be finishing up our meal just at the moment that the Disneyland Park fireworks were going off. 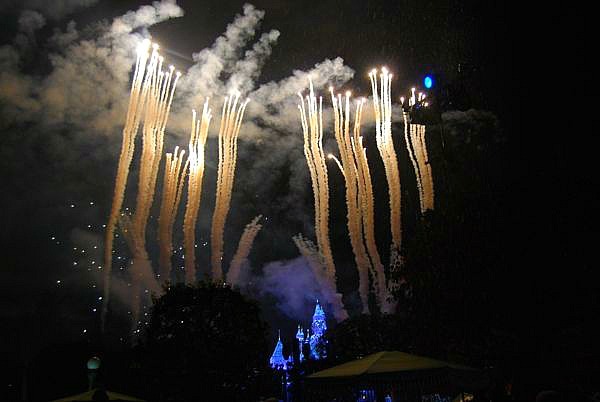 But, our plan to enjoy the Disneyland fireworks were foiled by the angry Anaheim winds. The Disneyland Fireworks were cancelled because even though it wasn’t windy on the ground there were reports of major winds up in the sky. Missing the Disneyland fireworks show was quite a bummer–but dining on the terrace was the absolute right choice because the view was the most entertaining part of the meal. 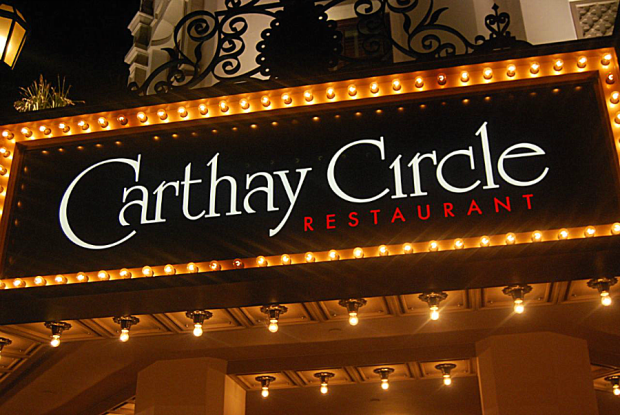 The Carthay Circle Restaurant premiered during the grand reopening of Disney California Adventure as the new central icon of the re-imagined Disney theme park. 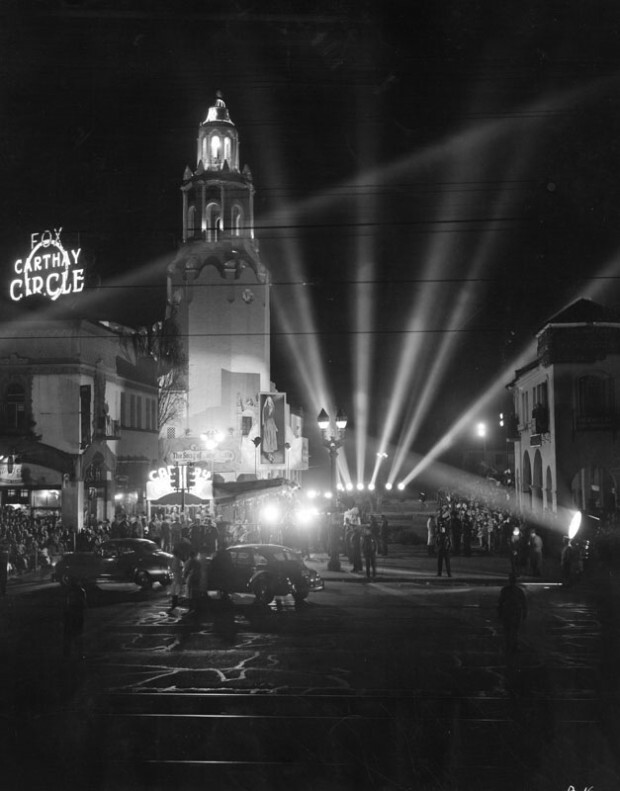 The original Carthay Circle Theater located in Hollywood was where Snow White and the Seven Dwarfs, Gone With the Wind, and Fantasia all premiered. The Walt Disney Imagineers considered the theater is a big part of Disney’s history and decided that it would make a beautiful centerpiece for the newly refurbished Disney California Adventure theme park. As you walk along Buena Vista Street, the entrance area of Disney California Adventure, the dazzling white Carthay Circle Theater draws you into the fantastic world of the bygone era of Hollywood. 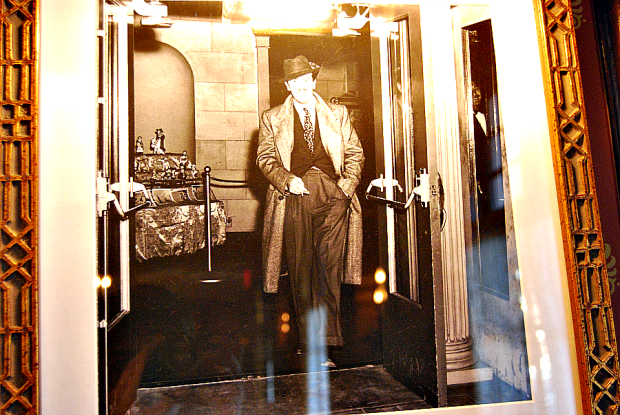 Inside of the theater find fantastic old photos of Walt Disney and the people who helped to create the original Disney Studios productions. Many of the photos used in this review were taken during the free Story of the Carthay Circle Restaurant tour offered every day at 10:30am. The tour is delivered by a knowledgeable restaurant hostess and lasts just around 15 minutes. The tour is a great way to see the restaurant if you don’t plan to eat there, or even if you do plan to eat the restaurant, it is the best lighting to get pictures. The reception area is home to many different pieces of artwork, photos, and a display case that rotates constantly with pieces from the Disney Archives located on the Disney Studio lot. 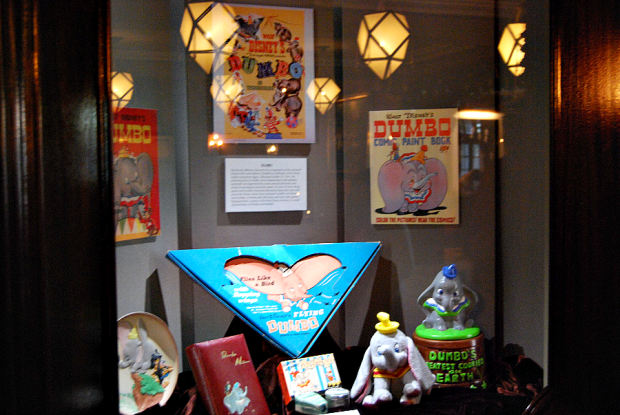 When we were visiting, the Disney Archives display case was filled with pieces from Dumbo. 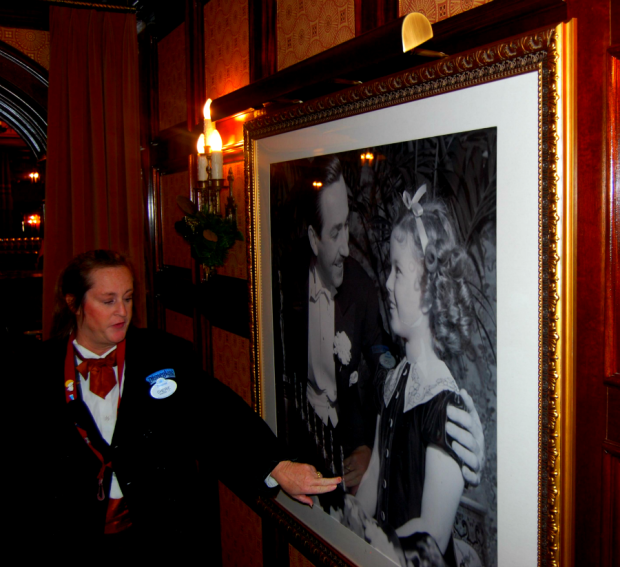 One of my favorite pieces in this area was a picture of Walt Disney where we was holding a cigarette. Even though I have always been so saddened by Walt’s choice to continue to smoke, especially since it ultimately led to his death, seeing a real picture of him is amazing. Walt Disney’s picture’s have always had the cigarettes airbrushed out of them by the publicity department. It wasn’t until recently that you would ever see Walt Disney holding a cigarette in a picture endorsed by Disney. 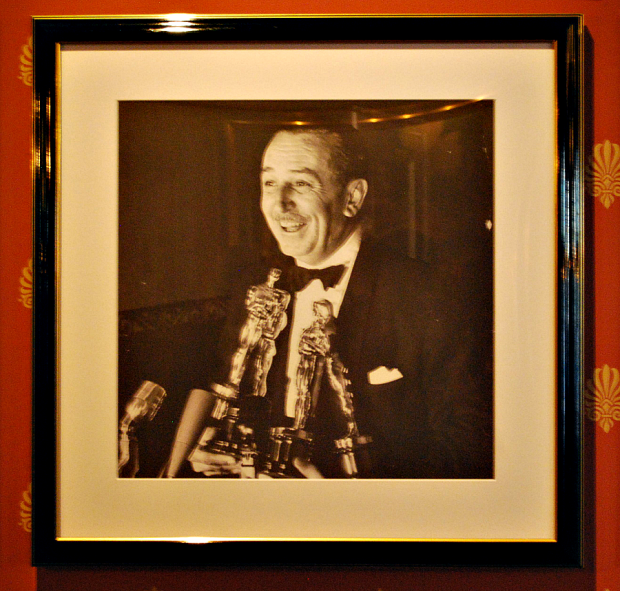 Saving Mr. Banks was created in this same vein of showing show Walt Disney truly was. 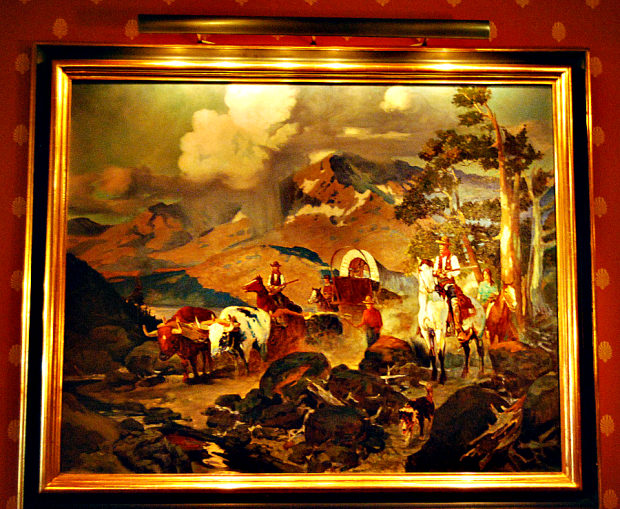 Located next to the stairs is what appears to be a huge mural, but in fact it is the design that graced the curtain in the original theater. 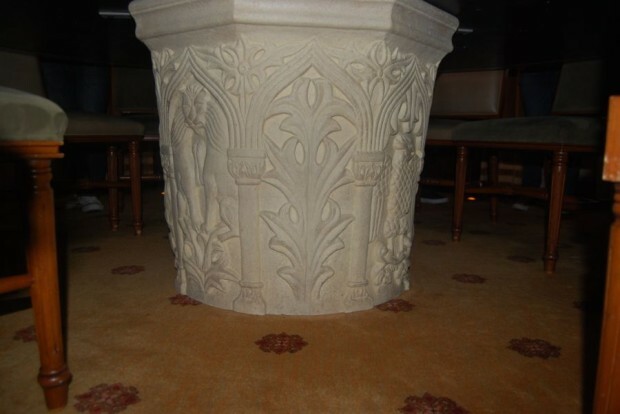 It is touches like these that set the Carthay Circle apart from restaurants in the original Disney California Adventure. Walking upstairs or taking the elevator, you arrive on a long hallway that leads towards the main Carthay Circle Restaurant. At the end of the hallway you will emerge on a large dining room with a beautiful ceiling featuring a mural reflecting the pan pacific auditorium and designs from classic Hollywood. Off of the main dining room are smaller seating alcoves that accommodate party sizes from 6-12 depending on the room. Each of these rooms are home to different themed pieces. My favorite is the central room located in the central turret of the theater. Inside of the theater not only do you get views out to Buena Vista Street from multiple angles, but also the table sits on a replica of Snow White’s wishing well. On either side of the large dining room are two smaller rooms. 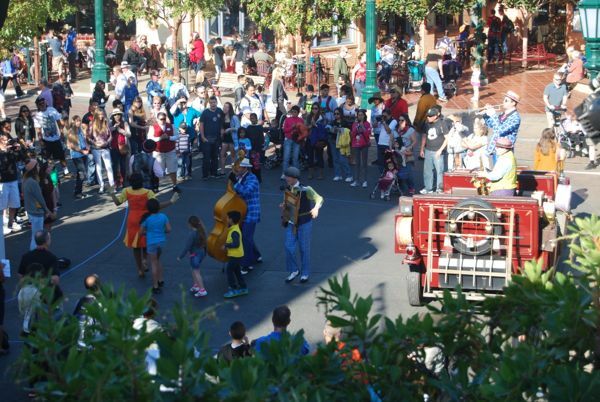 Off of these rooms you will find the two terraces that look down on Buena Vista Street below. When we ate here we enjoyed our meal on the main terrace that looks out at Buena Vista Street and beyond that all the way down Main Street to Disneyland’s Sleeping Beauty Castle. 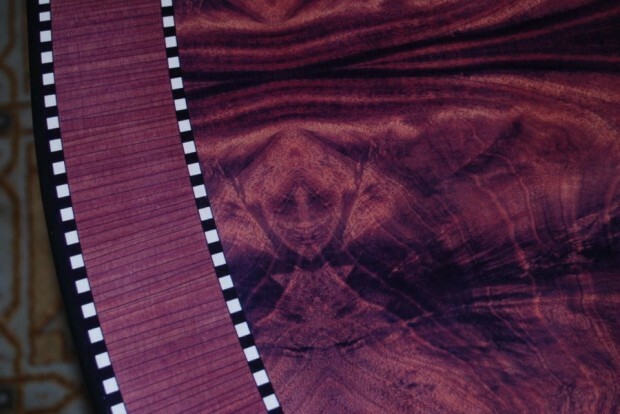 Engrained in the wood of the tables in the main room is a design reflecting the evil queen from Snow White and the Seven Dwarfs. As Club 33, the private Disneyland club goes down for refurbishment, the Hollywood Room, located off of the left side of the Main Dining room will become member’s new home. 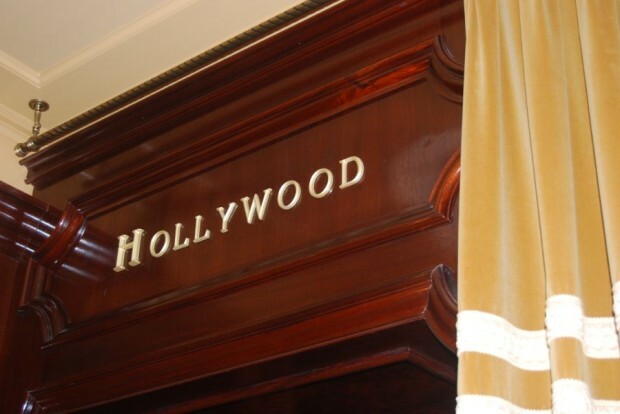 From January 6th to the reopening of Club 33, members will be able to make reservations at the Hollywood room. The only true reason for members to make reservations here is to enjoy meals surrounded by other members, but from what I understand, the Club 33 food and wait staff haven’t joined the Carthay Circle Restaurant. The Carthay Circle Restaurant dress code is not strict as it is located in the center of a theme park where people aren’t expected to be dressed up. We chose to come in our best jeans–wearing anything more than khakis would make you feel out of place. In the first year since the opening of the Carthay Circle Restaurant, the biggest problems reported were based on the lack of good service from the restaurant wait staff. But, during our recent visit we experienced nothing but the best service from all or our wait staff. The bread was always hot, waters were always full, and everything we needed was attended to. The Carthay Circle Restaurant is one of the top four restaurants on Disneyland Resort property. 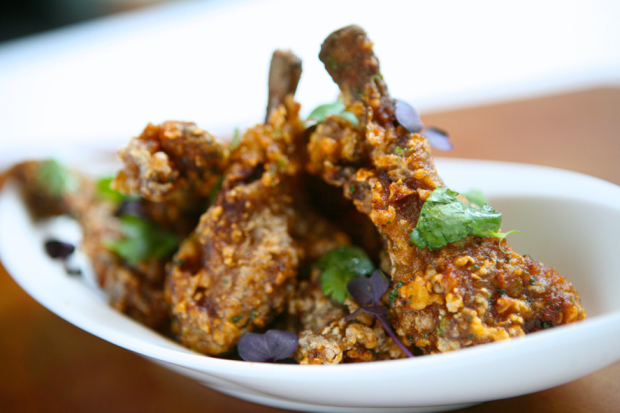 The exotic cuisine is carefully crafted to be a delight for both the eyes and the stomach. 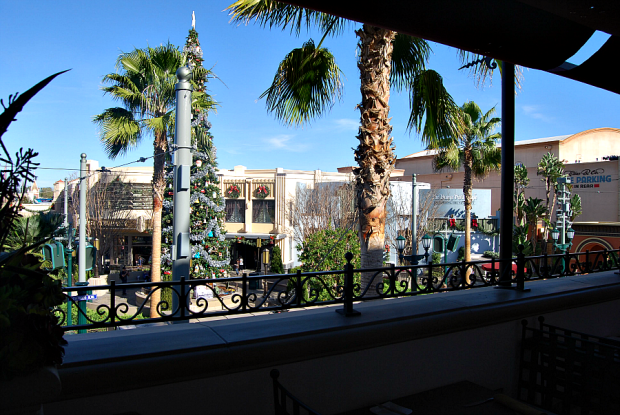 Whether visiting for lunch or dinner, I highly recommend the Carthay Circle. Any true Disney fan or foodie should try the Carthay Circle Restaurant–we give it a 5/5 because of the fantastic food and wonderful ambiance. What are your top four restaurants on Disneyland Resort property? Gary Naming my four favorites is quite difficult. Check out my complete summary of the best food in Disneyland. I will say my favorite restaurants for each meal. Corn Dog Castle For Lunch: corn dog with apples. Not chips. Everyone needs some healthy food to keep you going. Carthay Circle or Club 33 for Dinner. See our full Club 33 dinner review.